To get more stitches in knitting, an increase is needed. A common method of increasing stitches is known as a make-one, abbreviated as M1 or M1L, for make-one-left. The most basic way to increase is knitting in the front and the back of a stitch. The make-one is performed in between two stitches, with the bar between the stitches. To make an M1L or make-one-left, take the left-hand needle and pick up the bar between the stitches from front to back, as shown in the picture. Use the right needle to knit this bar through the back loop. There is also a stitch known as the M1R or make-one-right, which involves lifting the bar from the back and knitting it through the front loop. This one is a little trickier, and patterns do not always specify which one of these stitches they want you to perform (the pattern will just say M1), which means you can use either. M1L is much easier once you have tried it a couple of times. The same stitches can also be worked on the purl side, just purl through the back loop for a make-one-left and through the front loop for a make-one-right. Purling in the front and back is not quite as intuitive as knitting in the front and back, though the technique is the same. Due to different manufacturers of patterns, terms and methods may differ from what you may be familiar with. Check the pattern instructions closely to make sure you are performing the exact increase that the designer intended. You should know that a lifted (or raised) increase is sometimes referred to as a make-one or a bar increase, so how do you know which increase to use? Usually, the pattern has a list of terms. In most cases, when abbreviations are used in the pattern, an explanation is given somewhere in the notes for the pattern as to what the abbreviation means. The place where you will usually need to work in an M1 increase is along the edge and sometimes hidden in seams, but it can be difficult to sew a seam that is uneven because of increases. Patterns will usually tell you where to make one—whether at the edge of the piece of knitting or a stitch or two in. An M1 increase may be alternatively termed a "fully fashioned" increase. You will see this term associated with increases or decreases that include shaping such that you do not have a lot of excess material bunching up. The term tends to be used more in machine knitting patterns than in hand knitting patterns. You can place fully fashioned increase stitches a couple of stitches in from the edge. These increases become a design element in the garment, so it is important to know what increase the designer intends when you make increases this way. Raglan sleeves are the most common example. 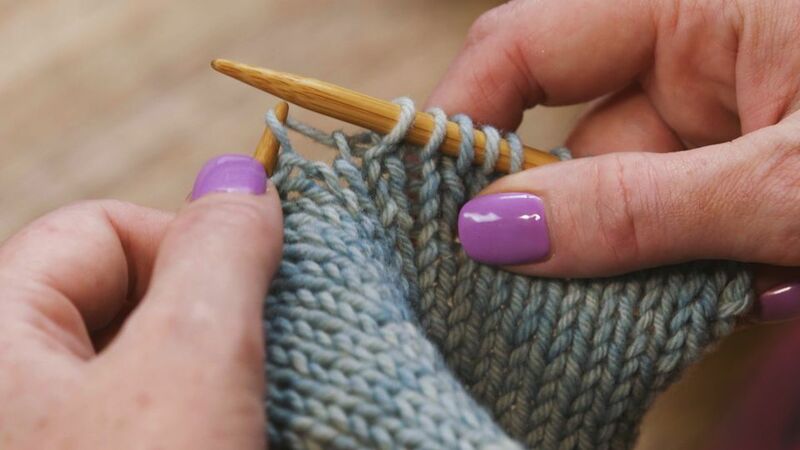 When you first start knitting with the M1, you may feel like you want to throw in the knitting needles. It can be a little tricky the first couple of times you do an M1, as it is a little tight. Once you get the hang of it, you will be using make-one everywhere you do not want your increases to be obvious.